Preheat oven to 350°F. 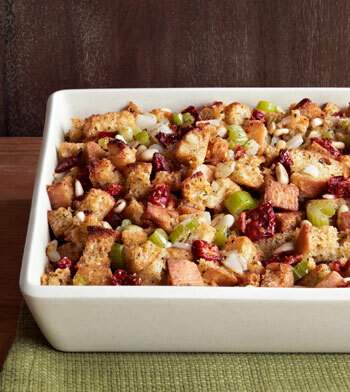 Place Mrs. Cubbison's Artisan Bread Stuffing in large mixing bowl. In dry skillet over medium high heat, toast pine nuts until golden brown; add nuts to mixing bowl with stuffing. In same skillet preheat olive oil; add onions, celery and garlic; sauté until translucent. Add sautéed vegetables, sun-dried tomatoes, basil and vegetable broth to mixing bowl with stuffing and pine nuts. Salt and pepper to taste and stir until combined well. Place stuffing mixture in a buttered, 2 quart casserole dish. Cover with foil and bake for 30 minutes. Uncover, and bake for additional 20 minutes.